Darragh MacAnthony with Barry Fry after the former's purchase of Posh in 2006. I gave it two years maximum. After all I’d heard it all before. Businessmen with exaggerated wealth making outrageous promises before realising the world of football is a tough one in which to thrive and prosper. Posh personalities from the last 10 years, from left, Barry Fry, Gary Johnson, George Boyd and Darragh MacAnthony. I didn’t change my mind after meeting Darragh MacAnthony (pictured, right, in 2006) for the first time. He’d made a vast fortune, at a very young age, in the property world which set the alarm bells ringing for a start, given he was taking over a prime city centre site. But 10 years later the big man is still here. So is the football club and those two facts are probably connected. And thank the lord for that. I dread to think where Posh would be without him. Not challenging for promotion from League One that’s for sure. It is of course easy to revel in the good times and Darragh, in cahoots with his bright young manager Darren Ferguson, delivered plenty of those in the early days. But it’s far more difficult to retain your passion, enthusiasm and drive when times are rough. And there have been some seriously rough patches in the last 10 years, on a personal level as well as within the football club. Darragh MacAnthony with former Posh manager Dave Robertson. But Darragh hasn’t baled out as soon as things didn’t go his way. He’s no David Cameron. He admitted his personal wealth took a hit when the property market crashed a few years ago, but he’s still in there fighting against low attendances, high rents and massive expectations, the latter being a by-product of the success he generated in his early years at the club. 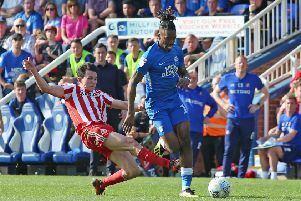 The difference then was Posh could afford to hang on to their superstars like George Boyd and Craig Mackail-Smith for a decent length of time. Now, partly because of those worrying attendances, it’s not so easy. The pockets aren’t quite so deep, although some of the financial commitments Darragh still makes to the club are eye-watering to us mortals. Of course Darragh hasn’t been perfect. No chairman who appointed Mark Cooper, Dave Robertson and Graham Westley to manage our favourite cluub could ever claim to be that. They were optimistic punts, but then so was the original appointment of Ferguson. But then Darragh has earned the right to make the odd mistake. His openness with fans is (with the exception of his failure to ignore the post-match trolling on Twitter) viewed with jealousy by fans of other clubs. I remember the days when getting the likes of (past Posh chairman) John Devaney to say ‘no comment’ was seen as a major triumph. Now a desire to keep the fans informed takes priority over a desperation for secrecy. Darragh can also be a little thin-skinned, but my experience is of a man who doesn’t bear a grudge even when he is in complete disagreement. Why? Darragh is basically just a fan of Posh like the rest of us. He wants the same thing. Success. But he puts his money where his mouth is. You won’t find me complaining if I get to write a ‘20 years of Darragh’ piece for the PT.